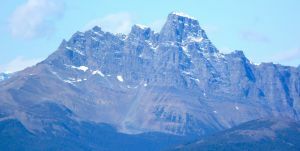 According to Place Names of Alberta, Volume I: Mountains, Mountain Parks, and Foothills, (Karamitsanis, 1991), "This 2930 m mountain was named in 1918 after Morrison Parsons Bridgland (1878-1948). He was born and educated in Toronto and had a background in mathematics and physics. He first came west in 1902 as an assistant to A.O. Wheeler. Bridgland was a fine mountaineer and was a founding member of the Alpine Club of Canada. His mapping skills were impeccable, and his maps were used as guides for alpinists who climbed after him. He was a surveyor for the Dominion Land Survey and performed extensive topographical surveys in the Rocky Mountains." Bridgland, in the course of his surveying duties, took many photographs in what is now Jasper National Park.